Stocks Tumble, Dollar And Bonds Spike After Navarro Crushes Hopes For A China Deal, Slams "Stench Of Goldman"
Anyone wondering what just spooked stocks, sent the dollar surging to YTD highs, and yields tumbling, look no further than Peter Navarro's speech this morning, delivered at the Center for Strategic and International Studies, where president Trump's main China advisor not only lashed out at Goldman and "globalist billionaires", but also accused Wall Street of "shuttle diplomacy" with Beijing, while predictably blasting his archnemesis, China, and repeating the point that "economic security is national security" is the guiding principle of Trump administration, and saying that "if China stopped stealing IP it would lose its economic edge" adding that "if China undertook structural changes US asking for it would be existential change for China." Finally, and most important for risk assets, he has dismissed prospects of a deal, accusing Beijing of wanting to “tap dance” and engage in economic dialogue so that it can keep doing what it is doing. 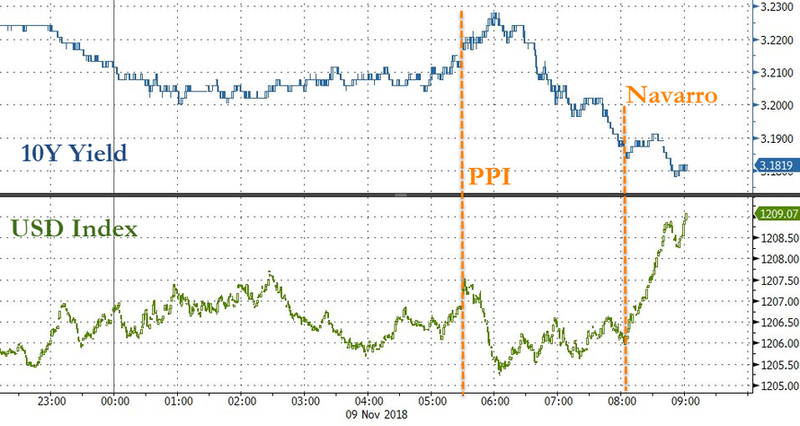 This, in a nutshell is what spooked risk assets and sent safe havens like TSYs and the dollar spiking, because as Navarro's speech confirms, there will be no breakthrough in the Trump-Xi meeting either in November, or any time in the forseeable future. Navarro begins by making point that “economic security is national security” is the guiding principle of Trump administration. He also invokes McKinley’s “Patriotism. Protection. And Prosperity” and the tariffs that followed from that as a great example. Navarro declares that steel and aluminum tariffs have been huge success and have been repudiation of classical economists’ gloom and doom view that tariffs are bad. The Section 301 tariffs have been “brilliant” and move has been “tremendously successful” at responding to Chinese “predation”. Declares that Trump’s “tough talk” has resulted in “landmark restructuring” of bad trade deals (Korus and NAFTA) “in Trump time”. Navarro is arguing now that Trump’s reversal of Obama policies re arm sales has brought defense jobs home. First answer is “budget sequestration” which he blames on “previous administration and Congress”. Third answer is decline of defense industrial base due to forces of globalization and “unfair trade practices” of both allies and rivals like China. He is now lashing out at “globalist billionaires” and “unregistered foreign agents” for conducting “shuttle diplomacy” with China to pressure Trump into some kind of deal with Xi at G20. He argues that shuttle diplomacy is dangerous and would leave “stench of Goldman Sachs” on any deal Trump strikes eventually. Now argues that if China stopped stealing IP it would lose its economic edge. If China undertook structural changes US asking for it would be existential change for China, he says. He is now dismissing prospects of a deal. Accuses Beijing of wanting to “tap dance” and engage in economic dialogue so that it can keep doing what it is doing. Now mocking Promises Obama secures from Chinese for them to stop hacking US companies. He has another go at Wall Street and shuttle diplomacy. Urges Goldman Sachs to take its money to Dayton, Ohio. Before we move on worth pointing out that what we have seen today is an insight into internal Trump administration debate re China. With his criticisms of “Wall Street shuttle diplomacy” Navarro has been aiming at Mnuchin and Kudlow as much as Hank Paulson et al. Argues geopolitical case for TPP ignores that it would have devastated auto parts industry and others. Tariffs approach will “end episodically” when better deals come. The Trump culture, Navarro says, is to do things from a business perspective and to seed industries rather than subsidize. “For any of you who think tariffs don’t work .. spend like an hour on the internet” and look at anti-dumping tariffs. His job at White House, Navarro says, is to help create a manufacturing sector and jobs for “Americans who work with their hands”. ... and the Dow Jones in freefall, last down -270 points as any prospects of an imminent deal with China have just imploded.